Horse Bridle Assembly - How To Adjust For Your Horse? 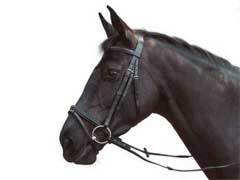 A horse bridle can be used with different bits depending on your training goals and level of training your horse has. You can also use a bitless bridle if you don’t want to use a bit; a regular bridle has to have a bit otherwise it can’t be used safely. You can even find pink horse tack to match your bridle! Once you have chosen your bit, place the horse bridle over your horses head and fit the bit properly. Make sure you have the reins over your shoulders so they do not drag. Make sure the cheek pieces lay flat against your horse’s cheeks. Make sure they do not interfere with their eyesight. Make adjustments by unbuckling the cheek pieces and moving them up or down. The next part of the horse bridle you need to check is the chin strap. You want to make sure you can only get one finger between the strap and the bottom of your horses chin. Make sure your reins are a proper length. To do this lay them over the horse’s shoulders and make sure your horse can lower its head comfortably but that the reins are not too long that they would get tangled. The last steps in adjusting the horse bridle involve the earpieces and nose pieces. Neither one of these areas are crucial in controlling your horse so they can be adjusted last. You want to make sure that they aren’t too tight and uncomfortable; even though they aren’t directly involved with control they can make your horse irritated. Ensuring your horse bridle fits properly will greatly help you have a pleasurable ride and your horse will be as comfortable as possible. Horse bridles and bits do not need to be complicated as long as they fit your horse and your training.